Finnish power metal act THUNDERSTONE, who released a brand new album, Apocalypse Again, last month, have released a video for a track from the album, “Fire And Ice”, and you can check it out now on KNAC.COM right HERE. 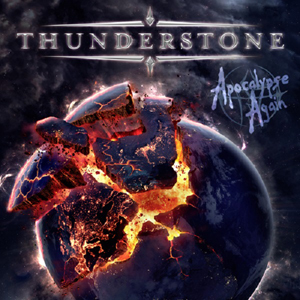 It is not only the return of the band after almost six years, Apocalypse Again sees Pasi Rantanen reunite with THUNDERSTONE. The band’s original vocalist, who left after 2007’s Evolution 4.0, has been an integral part of THUNDERSTONE’s characteristic sound ever since and was sorely missed after his departure back then. Apocalypse Again is melodic metal perfection. From the speedy opening track “Veterans Of The Apocalypse” and the catchy single “The Path” with its uplifting chorus, to the epic completion with “Barren Land” - it clearly shows that THUNDERSTONE are one of the finest offerings in the current scene and how much Rantanen was missing.